Whip up these easy, healthy cashew chicken tacos in the slow cooker as a weeknight dinner or a crowd-pleasing party appetizer. I know: another slow cooker recipe. But really, can you blame me? They're so good and so freakin' easy -- it almost feels like having someone make dinner for me for a change. 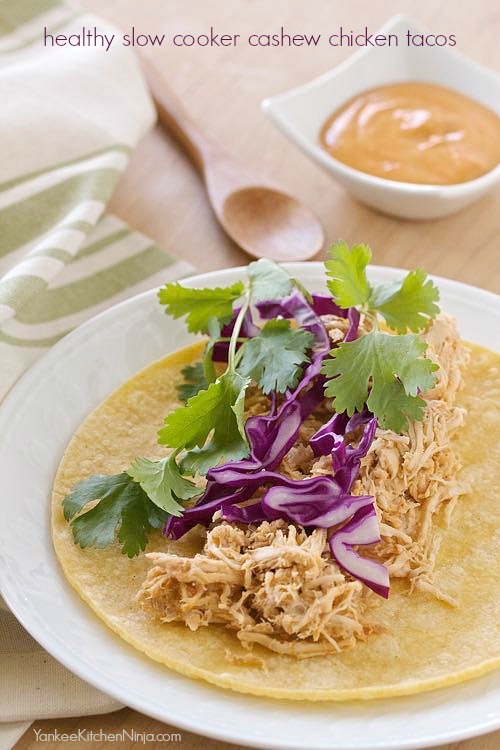 And this slow cooker cashew chicken taco recipe is no exception to the so-good-so-easy theme. Simply blend up a five-ingredient sauce, pour it over chicken in the slow cooker and -- SHAZAM -- a few hours later, you've got tacos! It's a pretty perfect healthy and easy weeknight dinner recipe. Plus, if you use corn tortillas instead of flour ones, it's a gluten-free dinner recipe, too. Really. It's that simple. Got a slow cooker? And something to blend up a sauce? You're all set. One of the secrets is using nut butter in the sauce. I used cashew butter but you could easily substitute peanut butter or any other nut butter you prefer for a little bit of a different twist. I also love that these slow cooker cashew chicken tacos have a nice spicy kick; if you prefer less heat, just cut back slightly on the chili paste and add an extra tablespoon of nut butter. Conversely, if you prefer your tacos very spicy, add even more of the chili paste to the sauce! And, as with most things I make in the slow cooker, you can turn the leftovers into a killer pizza. Just spread some of the sauce on a pizza shell, top with the shredded chicken, layer on some cabbage, cilantro and cheese and bake. Now that would make a great little appetizer for your next game day gathering! Are you with me in practically being wed to your slow cooker during these winter months? Leave a comment: The Ninj wants to know. If you use corn tortillas, this easy weeknight dinner is also gluten-free. Place the chicken in the crock of a slow cooker. Puree the nut butter, water, sambal oelek, garlic and salt together using a small food processor or blender (an immersion blender in a cup is great for this), adding more water a little bit at a time if needed until the mixture reaches a dressing-like consistency. Pour half the mixture over the chicken and reserve the rest in the refrigerator. Cover the crock and cook on LOW for about 6 hours or until the chicken is tender. Shred chicken with 2 forks. 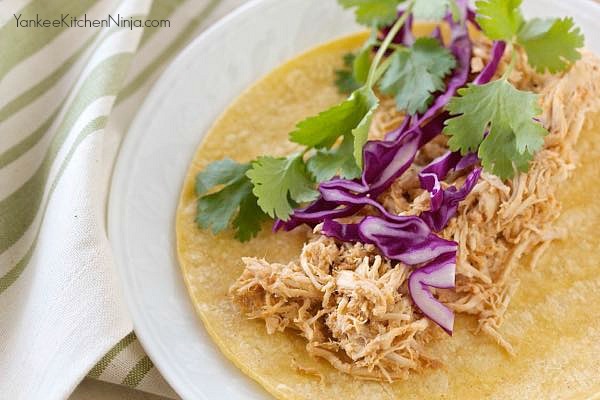 Place the shredded chicken on tortillas and top with the reserved sauce, sliced red cabbage and cilantro (I use both leaves and stems). 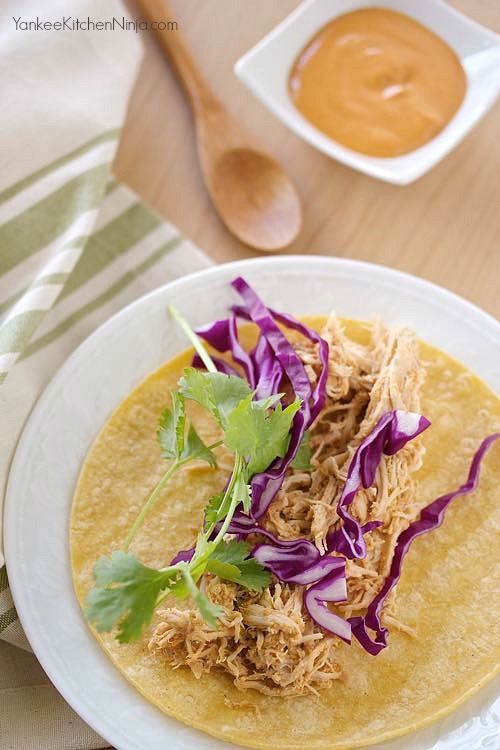 I'll be using my slow cooker more now that I have this excellent looking recipe! And as luck would have it, I just happened to buy some cashew butter. How fortuitous is that? !